Just a quick note. The premier international conference in the field of electric propulsion is the International Electric Propulsion Conference, or IEPC. The conference is organized under the sponsorship of the Electric Rocket Propulsion Society and is held typically every 18 months. The location alternates between the United States and overseas. Some previous venues included Pasadena, California, Moscow, Russia, the Princeton University, and Florence, Italy. This years conference, IEPC2011 will start in just few weeks in Wiesbaden, Germany. I’ll be attending and presenting a paper on “Multiscale Modeling of Hall Thrusters”, as well as chairing a session on Hall thrusters. The next IEPC will take place in the United States. The two finalists were MIT (Massachusetts Institute of Technology), and the university where I am currently completing my PhD, the George Washington University in Washington, D.C. Well, we beat out MIT! 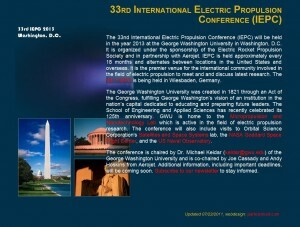 The 2013 IEPC will be held in Washington, D.C. in October of 2013. We here at Particle in Cell Consulting will work closely with the organizing committee to bring you a great conference. For now, this includes building the website for the conference. So far, only the splash screen is up, but more information will be coming shortly. This includes important dates regarding abstract submissions, and information about technical visits and social program. Stay tuned, and subscribe to the IEPC2013 newsletter to stay up to date with conference announcements. For additional information, regarding sponsorship, please contact the conference chair, Prof. Michael Keidar.